It's Friday Lovelies! This week sped by for me! How about for y'all? I picked up these tuxedo pants and could not wait to style them. I love the cropped fit---definitely need to pick up another pair soon! 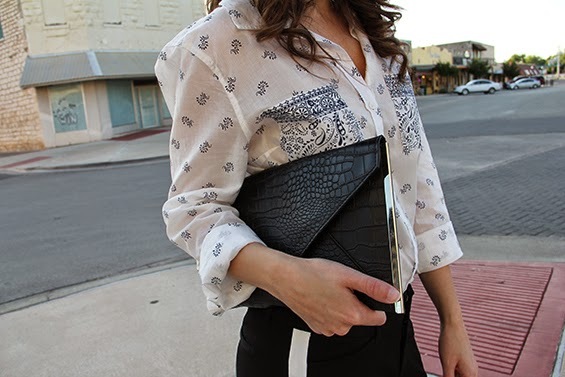 The black and white allows for so many style combinations! A print, solid, a flowy blouse, anything goes. I've been obsessing over The Voice this season (however, I CANNOT wait for Pharrell to be judge---I LOVE him!) Gotta say I was disappointed Kat didn't make it to the final! Do any of y'all watch? Love this look! Those tuxedo pants are perfect! That shirt is beautiful! I love your look! I'm so obsessed with this look!!! That shirt and those pants, ahhh too perfect! la camisa es maravillosa también. Amazing outfit! I'm so in love with the pants and the clutch! I love the shoes! They look simple and elegant from the front but are bold and so eye-catching from the back. Zara has the best shoes ever. a little something above and beyond the standard thick heeled sandal. That outfit is a TEN honey! that shirt is soo cute! Flawless, as always! Loving these pants! Super cute look! Love your sandals.